There's no better way to welcome the new year than with tickets to a show. The Uxbridge Music Hall has some great shows on our calendar for this year. 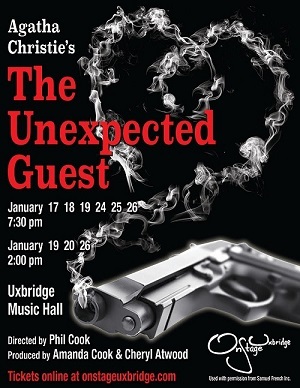 OnStage Uxbridge presents: Agatha Christie's: The Unexpected Guest. On a foggy night, Michael Starkwedder enters the home of the Warwicks through a window in the study. He finds the dead body of Richard Warwick, and finds Richard's wife, Laura, holding a gun that supposedly killed him. Michael does not believe she killed him, and she soon tells him she is innocent. The two decide to place the blame on an enemy from the past, MacGregor, a man whose son was killed by his car run over through while Richard was drunk. As the story progresses, it is revealed Laura was having an affair due to Richard's cruel nature, and was vouching for the man she was cheating with when she claimed to have killed Richard. All tickets are: $24.00 and include all taxes, ticket fees and Music Hall improvement Fund. Other great shows coming to the Uxbridge Music Hall after January include: Jesus Christ Superstar, Metropolis, The Fabulous Thunderbirds and A Funny Thing Happened On The Way To The Forum. Check out these great shows! Make it an evening with dinner and then theatre by visiting one of the many great eateries in Uxbridge including: Urban Pantry, Laura's Casual Kitchen, The Tin Mill, Hobby Horse Arms, The Passionate Cook's Bistro and many others. Visit: www.uxbridgemusichall.com for more great shows and to purchase tickets. We're looking at building our list. Do you have a friend who would like to know more about the events happening at the Music Hall? Forward this to them and ask them to Subscribe to this awesome newsletter. You can also contact us for more information. Visit our website and click: Contact Us. Copyright © 2018 Uxbridge Music Hall, All rights reserved. You are receiving this email as a special offering to patrons who opted in when purchasing tickets for production(s) at the Uxbridge Music Hall which was processed via StarTicketing. Designed by Township of Uxbridge.